I spotted this big guy just east of Peterborough, Ontario, on February 10th, 2018. 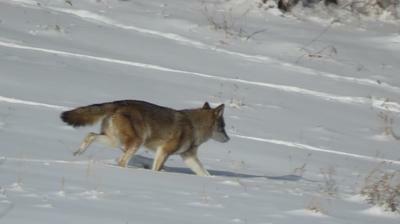 The animal was larger than a Coyote, but displayed similar marking around the face. It was spotted following the deer paths in the field beside me. A couple of days prior, neighbours had a deer taken down in their front yard during the day. 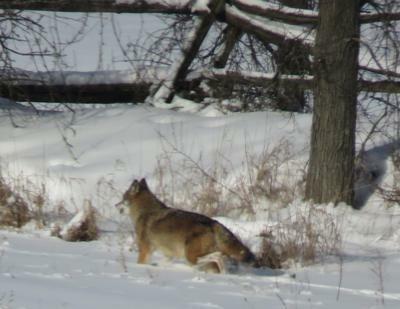 I'm very curious to know if this may be a wolf / coyote hybrid? Thank you for sending your report and great pictures. With luck one of our readers will be able to identify this animal for you. I live out in Ennismore since October and now just starting to hear them. I hate the sound of them at night when out with my dogs, I can never tell how far away they are or if they are headed our way. It's carrying it's tail up, it is most likely a Wolf. Hydbrid (Coyote/Wolf)-the ears are short and the head is large, along with a heavier build than an actual Coyote. There are lots of them in southern Ontario now.